ICI has rejected an improved offer from the Dutch firm Akzo Nobel worth nearly £7.8bn, saying it undervalues the firm. ICI, which makes Dulux paint, said its board had unanimously rejected the new 650-pence-per-share offer, but added that talks with Akzo were continuing. Akzo, whose brands include Crown Paints, had a 600p-per-share offer for ICI rejected in June. ICI, which has 26,000 staff worldwide with 3,500 in the UK, is reportedly holding out for a 700p-per-share offer. Akzo has had plenty of cash to spend on an acquisition since it sold its pharmaceuticals business Organon BioSciences to Schering-Plough for 11bn euros ($15bn; £7.4bn) in March this year. The Dutch firm has also made a deal to sell ICI's adhesives and electronic materials businesses to its German rival, Henkel, if the takeover goes ahead. Akzo said ICI would be "a highly attractive addition" to its coatings business and noted that its new offer represented a 40% premium to ICI's share price on 9 March. 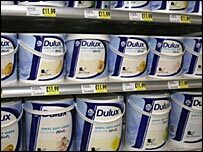 However, there has been speculation that any takeover of ICI by Akzo could attract the attention of competition watchdogs, as Dulux has 40% of the UK paint market while Akzo's Crown Paints has 14%. ICI has been seen as a potential takeover target for some time, with speculation increasing following last year's disposal of its flavours and fragrance operation Quest. At its peak, the firm was an industrial powerhouse in the UK with interests in pharmaceuticals, food additives and dyes, but since the 1990s it has suffered cost pressures and refocused the business on paints and specialty chemicals.